This story should have been emotional powerful and moving. But all the parts that should have been emotional or dramatic were filled with whiplashing emotional and moral stances that just left me wondering what any of them were really feeling. Honestly it felt like it should have been a love story between Chloe and the brother with Olivia as the complicated emotional issue that kept them apart. Chloe even says, He made me strong and stand up for myself while your kindness and control made me weaker everyday I was with you. The big confrontations throughout the end were also bizarrely carried out. apart from the above statement Chloe basically said that Olivia never really loved her and just transfered her pity into love. And yet her love is real? She entered that confrontation like someone trying to make a stand and cut ties not someone trying to explain a difficult and hurtful time to someone she loved and was supposedly trying to win back. At every turn it was made to be Olivia's fault, everything was her fault and everyone else was just paying for her failures. And Melanie was a character that confused me as well she kept giving wildly differing advice and attitudes towards love, bisexuality, commitment, and herself. So just confused and a bit frustrated at the end of this one. An enjoyable story read by a good narrator. Yes. I would definitely recommend this book, the story is a nice one. I really liked the characters and was pulling for them from the beginning. Plus the story is filled with animals that just make you smile. Olivia. Because she has the biggest heart and really cares for the animals. She feels things deeply and is just a genuine & nice person. Have you listened to any of Clara Nipper’s other performances before? How does this one compare? No I haven't. I enjoyed her narration though and would listen to her again. If you could take any character from A New Leash on Life out to dinner, who would it be and why? Olivia. Same reasoning as above. She is genuine and has a good heart. She would be a great friend. 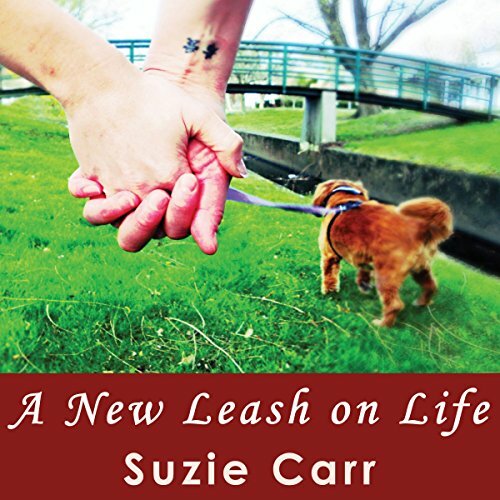 I really enjoyed this story and look forward to reading/listening to more books by Suzie Carr. I will also happily listen to this story again. A sales pitch for reiki wrapped in a thin story. The books premise was promising but the reading is stilted and the content feels like more of a sales pitch for reiki and ranting about "puppy mill supporting pet stores." It also has some very jaded views on bisexuals. narration is horrible at best. I switched to reading on kindle. Not sure where Audible finds these people but I become more and more prone to read vs listening. Good story! I felt the book took to long to get to the climax of the story. it made me skip to the last chapter just to see if it would finally resolve itself. there was long pause out of the blue that broke the mood. I feel if the story was more to the point and or longer in the end to let the listeners have more time with the main characters after things were delta with .I think the reads would not feel cheated. the book would have been better if it wasn't for the performance of clara nipper. I will definitely avoid her in the future, she ruined Susie's book. The narration was painful to listen too, the background noise, the hum of the audio booth and the lack of emotion in her voice. I read the book and enjoyed it a great deal and decided to purchase the audio version. I feel robbed. This book was hard to get through mostly because of the narrator. I had a hard time following the storyline which was too simplistic and not enough background it got on my nerves. I would not bother with this book either paper War by listening to the narrator in the words of this book and the characters.